Melbourne dog­ owners, rejoice! We’ve compiled the top five walks to take your dog on in and around our glorious city this weekend. If you’re bored of the same old walking tracks and scenery then this is the guide you’ve been waiting for. You and your pooch can head up the promenade and play in the sand, or hop in the car and go mountain-side. Most of these areas are off-leash (with the exceptions of nature reserves). We also took the liberty of getting advice for the weekend walk straight from the dog’s mouth! 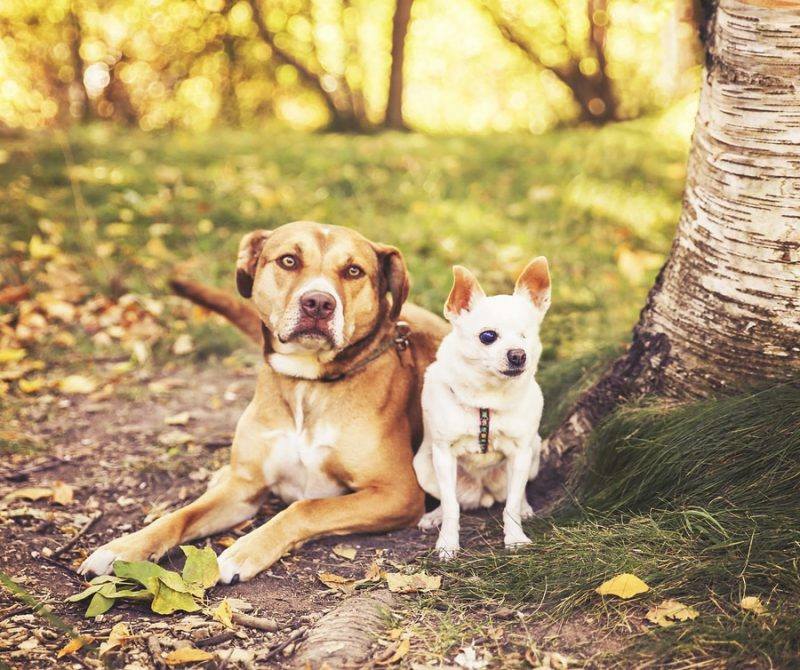 We contacted social media stars Lenny and Bentley to find out where their favourite walks are located. Read on to find some inspiration for your next weekend adventure! Your dog can lock in some much ­needed face-­in­-the­-breeze­-lean-­out­-the-­window time as you head up to the Dandenong ranges this weekend and check out the gorgeous Olinda creek walking track. It’s a 10 kilometre return walk, rated easy to moderate, through the Silvan Reservoir and boasts stunning views of natural reserved habitat, eucalyptus trees and bright green mossy areas abound. The fresh air and break from the city humdrum will leave you and your pooch feeling refreshed and once again in tune with nature. As it is a reserve, dogs will need to remain on leash, but that’s a small price to pay to let them snuffle through the undergrowth and feel those animal instincts once more! Situated around the highest point of the Yarra river accessible to the public, the Upper Yarra Reservoir park is a full­ on weekend getaway ready for the taking. Dogs must remain on ­leash but are welcomed as camping compatriots should you feel like pitching a tent or bringing a caravan and going grounding this weekend. Get back to your roots, pack a few picnics and some warm clothes and comfortable shoes. The Upper Yarra Reservoir park is an absolute gem and home to the beautiful Batt’s Creek track. Don’t forget to check out the various lookouts to see water gushing back down toward Melbourne and watch the drool form on your dog’s face as he imagines gleefully jumping down into the splashing surrounds. Beside St Kilda pier and continuing on to Sandridge St, St Kilda’s West Beach is one of the most accessible dog beaches in Melbourne. With gorgeous harbour views and a smattering of beach side cafes to refresh owners and pets alike, this beach is a surefire way to release the hounds and any pent-up energy they may be feeling from the past week. Let your pooch run wild, chase seagulls and dig excitedly through the sand to uncover all things curious. The shallow water means dogs will enjoy a quick dip and paddle. Winter won’t stop the curiosity in your pup as he to she watches the tiny shoreside fish darting in and about under the surface! Tucked away in secluded Belgrave South, the Birdlands Nature reserve is the perfect weekend walking track for pets and owners. It is a native animal reserve, so your pup will have to remain on leash, but the pay­off in seeing the myriad native flora and fauna (and even Platypus!) is worth it. You and your dog can get some fresh air and exercise and breathe in the delicious scents of native wattle and bottlebrush along this easy, flat walking track. The Inverleigh Flora Reserve is a bit of a drive, located 27km west of Geelong on the Geelong ­Hamilton road, and is cared for by volunteers. This pretty reserve is home to a huge array of native species of flora and might even be a great space to spot a few native blue­banded bees! Your puppy might attempt to snap at a few of the flying insects so be sure to keep a leash handy. This walk is 9km long and pretty ‘out bush’ with no public facilities around. You will have to be sure to bring enough food and water to last you and your pup and take a few rest breaks. However, the reserve boasts over 50 species of native orchid and there have even been reported koala sightings so it’s not to be missed! If you’re still after more of the outdoors after visiting these beautiful places, the Daily Fluff has got the inside scoop from some of our favourite influencers. Do you have a favourite weekend walking spot around Melbourne? Comment below and let us know! It doesn’t matter how prepared you are, toilet training a puppy is not something that happens instantly. It requires patience, consistency and understanding, and it is something you should start working on as soon as you bring your pup home, and be continued until the training is complete. Puppies are, well, puppies, and naturally don’t understand that accidents on the carpet are frowned upon! To make the training process easier, we’ve put together a list of tips and tricks to help you along the way, and to help make the (sometimes disgusting) process easier. This is a great method to use when training your puppy. Place newspaper or training pads all over the floor of the room the puppy is predominantly in — which works great if you’re keeping the pup in the laundry or a confined space overnight or when you go out! Slowly reduce the amount of newspaper/pads, until there’s only a small corner covered. Then, slowly move the last piece of newspaper/pads further and further towards the door and eventually outside. Once the puppy understands this is the spot to use, take the paper away. This means after meals and drinking, as soon as they wake up and every few hours in between. “When I was a puppy Mum and Dad would take me out into the backyard lots of times a day, and give me lots of kisses, cuddles and treats when I went to the toilet on the grass! I quickly learnt that wee wee’s are for outside, and not inside on the carpet!” says Bentley the Newfoundland. Even if you took your pup out 20 minutes ago, if he/she begins displaying the signs of needing to go, make sure you take them outside. The signs could be excessive sniffing, restlessness and anxiousness. Try not to yell if your puppy slips up and has an accident inside. As they are only young, puppies can be very sensitive and may not understand what they did wrong. Puppies can become anxious, which is understandable as they’ve just moved to a completely new home and environment. Instead of scolding them excessively after accidents, try positive training by praising them and giving them cuddles and attention after they do the right thing and go to the toilet outside. And what do the pooches Ollie and Oscar have to say? 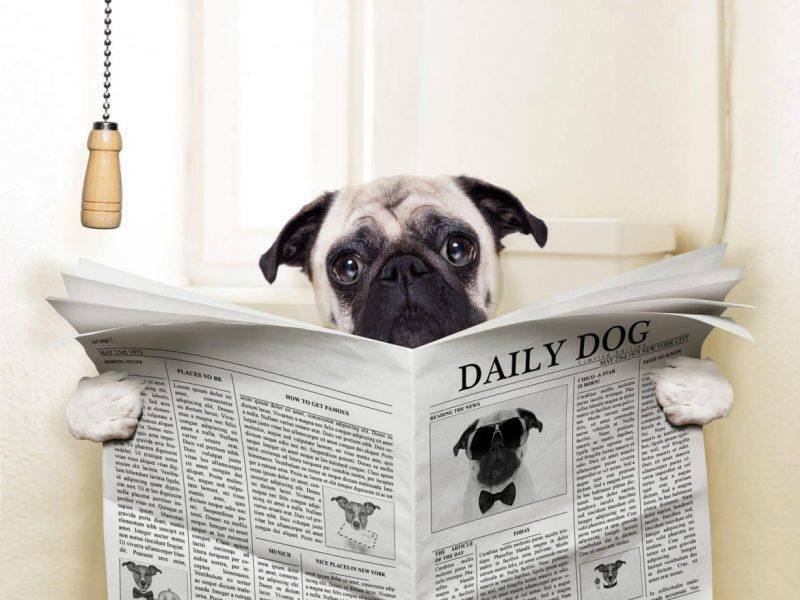 Do you have any top tips for toilet training your puppy? We’d love to know – share them in the comments below.